A Complete Horsemanship Program for riders of all levels designed to develop equitation skills, self-confidence, and a love of horses in 2-week sessions throughout the summer! Horse Day Camp is our premier English riding program for horse-crazy campers grades 4-10th. We offer a full-day program (9:00am – 3:00pm) of all horse-related activites including 2 riding lessons daily. Located at our private riding site in Moraga. Includes free transportation and free extended care. Horse Day Camp grew out of the unique and successful horseback riding program that is part of Roughing It Day Camp. It is founded, owned, and operated by Ann and Hobie Woods. All Adult Experienced and Nurturing Staff. All Roughing It programs are known for our exceptional staff. Our Horse Day Camp staff members are adults who are expert horse instructors and great role models who know how to make riding a fun and successful experience for every child. All staff are certified in CPR and First Aid. Camper Grouping. Campers’ abilities are checked out the first day and they are placed in a group that fits their skill level: Beginner, advanced beginner, intermediate, or advanced. Two Riding Periods Each Day. Campers have two formal riding lessons each day where they learn English equitation, hunt seat, show jumping, and dressage. Additional Horse Activities. Campers also participate in additional horse activities such as: Vaulting (gymnastics on horseback), mounted games, horsemanship, horse care, barn chores, and horse crafts (like making horse cookies!). Facilities. 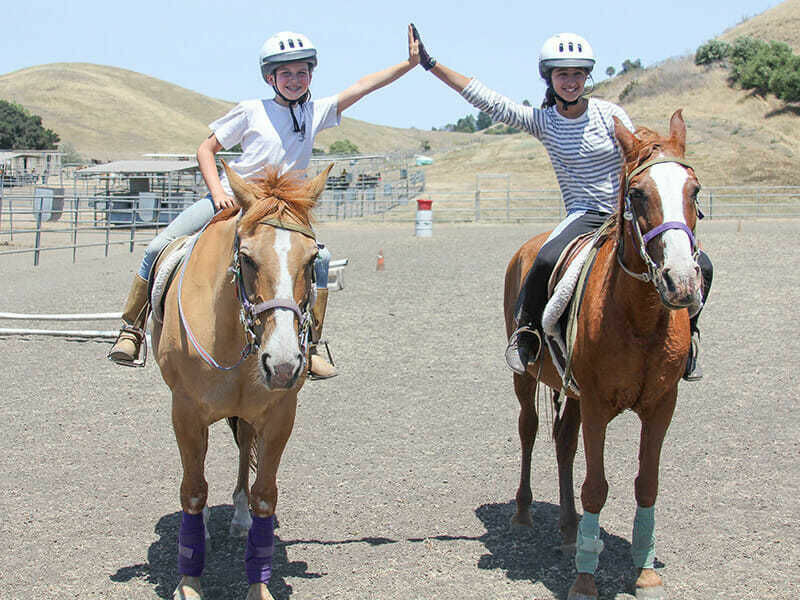 Campers ride in our large arena, and when ready they ride our cross-country course and trail ride in the “back 40” of our private ranch located in Moraga. Horse Show. Parents can see their camper ride on Thursday of the last week of each session! Safe and convenient bus service with professional school bus drivers. 36 central stops throughout San Francisco, East Bay, Lamorinda, and the 680 Corridor from Pleasant Hill to Pleasanton. We teach campers with a Certified Horsemanship Association (CHA) curriculum course. Beginning through advanced riders. Campers earn badges for completing program skill levels. Roughing It combines the quality instruction of a riding school with the fun of a real summer camp. We evaluate riding skill on the first day of camp and group campers with riders of similar skills and experience. 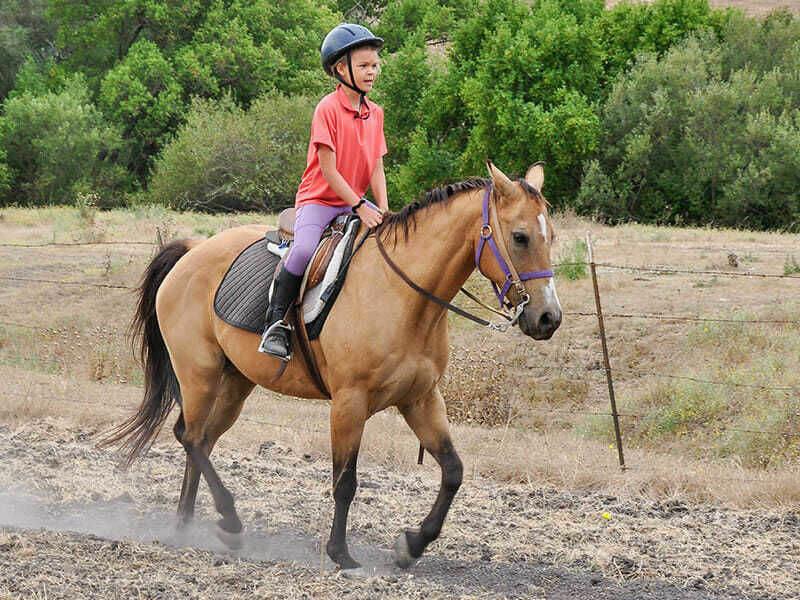 She absolutely loves horses and riding and wanted a full day camp that would immerse her in horse riding. The entire experience was an absolute plain joy. After just 2 weeks of horse camp she knew so much about horses and riding. Her confidence and comfort level around the horses was great to see. I started RI after being on a horse once, and within a summer I was cantering confidently, by the end of RI I was jumping near on 3 feet!